“Atlantic Pier Sunrise” is a 3 bedroom & 3 bath oceanfront villa located on the 3rd floor of the Charleston Oceanfront Villas. This condo was recently renovated and refinished. The professionally designed interior features a fully-stocked kitchen including brand new stainless steel appliances and granite counter tops. Enjoy the view of the famous Folly Beach Pier from the comfortable living and dining room. The villa comes equipped with a plush sectional sofa perfect for lounging after a long day at the beach. Watch TV on the huge flat screen TV or browse the internet with wireless access. Exit onto the balcony for a one of kind view. The unique advantage to this view is the ability to view the island as well as the ocean and pier. Wake up refreshed and watch the sunrise. The master bedroom has a King sized bed, walk in closet, and a fully renovated bathroom including a glass encased, walk in tile shower. Down the hall are the two guests bedrooms each with their own bathroom. One bedroom has a queen bed and the other has two twins. Both bedrooms are beautifully decorated with guest’s comfort in mind. The Charleston Oceanfront Villas boasts 2 community pools, nestled right next to the beach, and directly under "Atlantic Pier Sunrise". The two pools are open seasonally from April 1st- October 31st each year. The elevated nature of the Oceanfront Villas, also ensures that there is covered parking underneath the building. Charleston Coast Vacations offered by dunes properties is Charleston's highest rated vacation rental firm. We offer approximately 80 privately owned vacation rentals across the Charleston Coast. Our family really enjoyed the stay at Folly Beach. The unit was very nice with a beautiful view. Plenty of space for our family of 6. 2 of the burners on the stove top did not work and I thought the unit could be a little cleaner but these are minor items that did not detract much from our stay. Folly Beach is a fun beach town and this was right in the heart of it which was great. We’d go back. This place is really nice. Great location nice beach views and all on 1 level. Beats the place we owned in Waters Edge! Thanks for the review! We are glad that you enjoyed your time on the ocean side of the island! 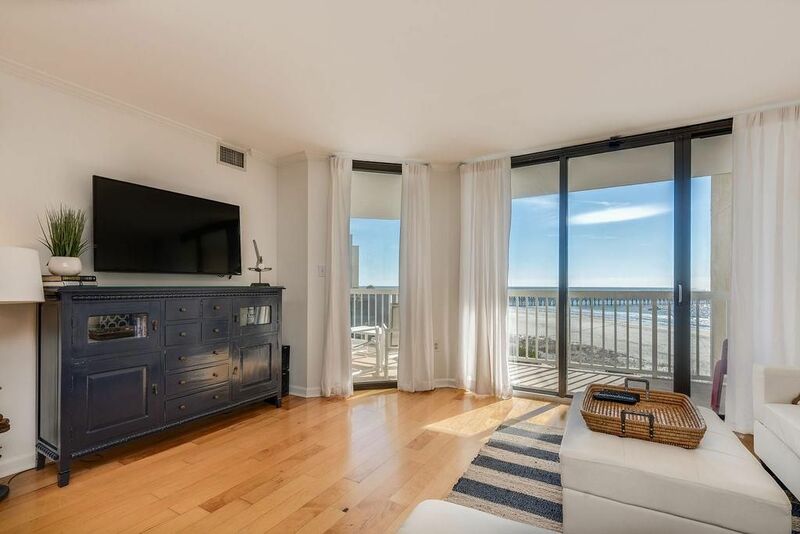 Water's Edge has lovely river views and a little more space to spread out but there is no comparison when staying in a well appointed and recently renovated unit at the Charleston Oceanfront Villas like "Atlantic Pier Sunrise." We hope to have you as a guest again soon! Loved the stay and the condo was clean and has been greatly maintained. We had a wonderful stay. However, an unexpected VRBO Fee of $137.00 appeared on our statement. Did not appreciate it as we have used VRBO before. Buyer Beware of hidden charges of VRBO. Book directly, if possible. Got together with my girl pals for a long weekend. We had a blast. The condo was clean, cozy and beautifully decorated with a beach/nautical theme. It was the perfect location within walking distance of the main drag of Folly Beach. Loved the pool, and loved being right on the beach. All of us had a relaxing time catching up with each other. Thank you for providing such a wonderful spot! Overall this was a fantastic condo! The condo was just like the listing description said it would be. The Villas are right on the beach and within short walking distance of the pier, restaurants, good music, and shopping. Our condo was very nice and in a nice location. We were very pleased with the accommodations. This condo also featured a very nice TV that allowed us to view our vacation photos with ease. The beds and couches were comfortable. The kitchen was well stocked with dishes and appliances. The balcony was completely free of bird poop, probably because of the bobble-headed owl that was guarding it. We were able to just relax and enjoy our vacation. We thought it was very nice, but it wasn't perfect...thus the four stars instead of five. We noticed a bit of noise in the mornings from the garbage pickup and other neighbors. Also, some of the lights were out, and a couple of areas were not completely clean. One example of this, was that the couch had a bit of sand still left on it from the previous tenants. However, these were minor issues that were mostly overshadowed by the niceness of this place...and if we could have given it four and a half stars, we would have. We would definitely stay here again. We would recommend this condo for anyone who would like a nice relaxing place to stay on the beach. When booking a reservation for any of our properties, your reservation will automatically include a $69 Red Sky Damage Deposit Waiver. This is an insurance policy that covers up to $3,000.00 in accidental damages to the vacation rental property. We find that this allows out guests to have a worry free stay, as both the guests and the property owners are protected from unwanted expenses when damages occur. If you wish to remove the Damage Deposit Waiver, then a $3,000.00 deposit is required in its place.